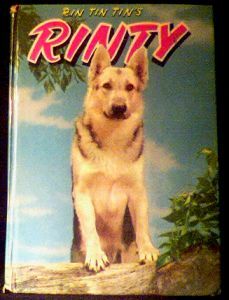 Whitman tv adventure novel featuring Rin Tin Tin's son, Rinty. Book has some edge wear on ends of spine and a child's name is written on the inside cover and the contents page. Still very nice condition for a 45 year old book. The original Rin Tin Tin was a dog rescued from the trenches of World War One and brought to Hollywood to become a silent movie star. In the fifties, the Rin Tin Tin tv show was a Saturday morning favorite. Website design and hosting by Sohodojo Business Services. Item 309 of 466 items displayed in viewer. 0 items in cart.